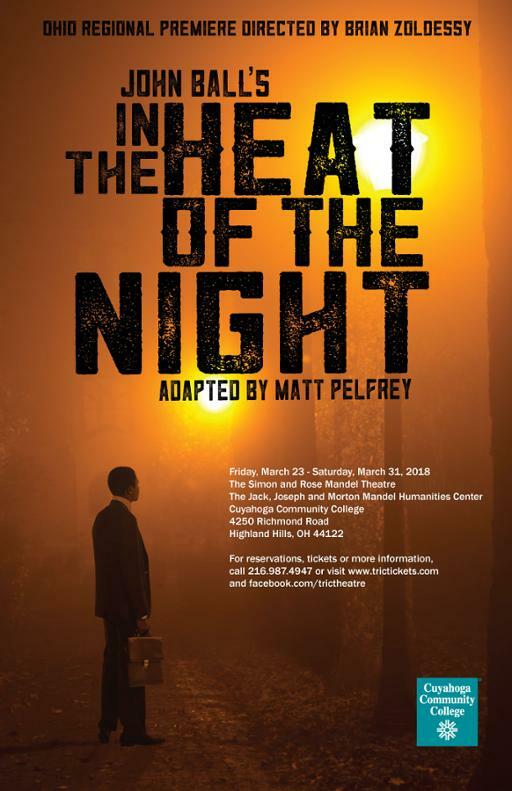 Watch for clues to solve a mysterious murder as students from Cuyahoga Community College (Tri-C®) present In the Heat of the Night at Eastern Campus. Seven performances of the play based on John Ball’s award-winning novel will take place March 23-31 at the Simon and Rose Mandel Theatre, located at 4250 Richmond Road in Highland Hills. In the Heat of the Night takes the audience to 1962 and the small town of Argo, Alabama. Police find a dead body in the road on a hot August night. They have no witnesses, no motives and few clues. But officers do come across a black stranger named Virgil Tibbs — a homicide detective from California who immediately becomes the prime suspect as the racially tense community looks for answers. Performances will take place at 7:30 p.m. March 23-24 and March 29-31, 2 p.m. March 25 and 10:30 a.m. March 29. Tickets are $10 for adults and $8 for seniors or students from schools other than Tri-C. (Admission is free for Tri-C students with a College ID.) Reduced rates also are available for groups of 10 or more. For tickets, call 216-987-4947 or visit www.trictickets.com. A film based on Ball’s novel and starring Sidney Poitier and Rod Steiger won five Academy Awards in 1967. The novel also inspired a television series starring Carroll O’Connor that aired from 1988 to 1995.